Back when I worked for "The Man", meetings were a big, fat, hairy part of every day. My performance was actually graded on how many meetings I attended. There were meetings to follow up on prior meetings, meetings based on what day of the week it was, and meetings for the alleged planning of future meetings. And they never let me knit in any of them. No wonder I always wanted to chew through my own arm to get away. Fiberista Karen starts the day properly. Note daily fiber intake in foreground. I chose a really gorgeous yarn base for the Mystery KAL sample project. It's 100% BFL with gobs of "sproing" and super softness. Behold its pearly surface sheen; and that's before it's even got color! This is where all the magic happens, Gentle Readers: Creative creatures inspiring one another to make beautiful things for knitting. Oh, and here's what I love most: I didn't tell anybody making the yarn for the KAL what the project or the design is! They are almost as much in the dark of my web of Mystery as you are! Bwaahh ha ha hahaaaaa! That's right: I challenged the geniuses of color to make me a combo of surpassing perfection and beauty, without any idea what it's for...I'm Eeee-vil, I tell you, Pure Evil. I'm not one bit worried, either. You can't swing a knitting needle in that place without hitting some extrordinarily beautiful pile of floof or string. I promise, Friends, you will LOVE what they make for us. Here's a clue, for the sleuth-y among you. And no, it's not the color in this skein. This is the yarn that will be in our kit. 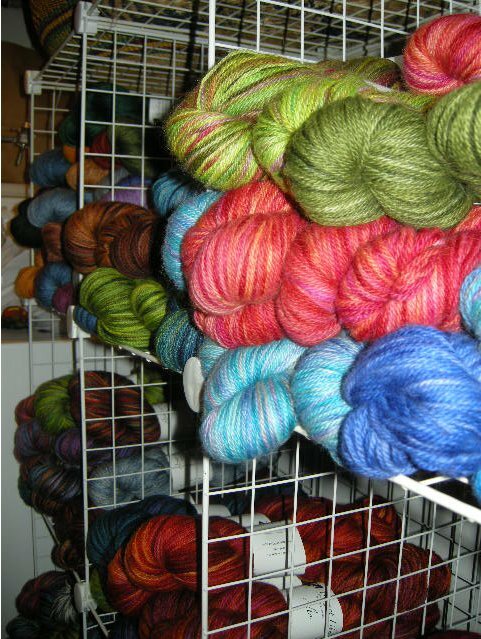 The yarn I'm making the sample from will be freshly prepared next week. As soon as it's dry, I'll knit the prototype, thus finding out exactly what yardage is required. Once that is known, I'll be able to tell you the price of each kit, and when they will be available. Until then, dear friends, stay patient. And be glad those cats at Abstract Fiber were willing to take a meeting.